Embroidery, a beautiful skill that occupied women for centuries, is making a comeback even when it was always around. It is as old as people have been making cloths. Embroidery is a handcraft for decorating fabrics or other materials by using a needle and thread, and also incorporating other materials such as beads, pearls, and sequins. We all know the expensive dresses of Haute Couture which make every woman dream away, the trend is now set by young designers and by more affordable labels. Many designers who were using prints are now exploring the possibilities of embroidery for creating amazing surface embellishment. The basic techniques or stitches used now differ not a lot of what we see on old examples of the earliest embroidery: chain stitch, buttonhole or blanket stitch, satin stitch, cross stitch remain the fundamental techniques of hand embroidery today. Elaborately embroidered clothing, religious objects, and household items often were seen as a mark of wealth and status. But who said embroidery is only for exquisite fabrics? De Gournay, known for their amazing hand-painted wallpaper on a silk background, are now embroidering a part of the dessin. Adding texture and contrast to make it even more breathtaking. Since ancient times embroidery was used to decorate the home. There are many styles of embroidery: floral, geometric, ornamental. They will all add some glamour and drama to the room, making a stylish interior. With meticulous attention to detail and perfection Maison Fey, known for their embossed leather, are creating pieces that are work of art, by adding touch of embroidery to accent the dessins. Embroidery was a skill every girl had to practice, it was their path into womanhood. Starting at young age to make their dowery: bedlinen, table cloths, curtains. Social rank was shown through the refined fabrics. Embroidery has something out of time, a touch of poetry when it is combined with a bi-colour print, type Toile de Jouy. Perfect for romantic interior style. A monogram is usually made by combining two or more letters. The initials of an person or a company, used as a recognisable motif. Artists and craftsmen started to use monograms when guilds enforced measures against unauthorised trade. Monograms were in the past also used by nobility, by the army, to show status. In the 80's labels and monograms were very trendy, the bigger the logo the better. Monograms are coming back in fashion; Dries van Noten is exploring this theme for his winter 2017/18 collection. A touch of luxury: monograms embroidered on your bedlinen, napkins, table linen. From traditional to trendy, embroidery is making a comeback and not only in fashion. Last week I was talking about wallpapers, ninety percent of the wallpapers are printed, only a very small percentage will be embroidered as it is a time consuming and therefor an expensive way of decorating the walls. 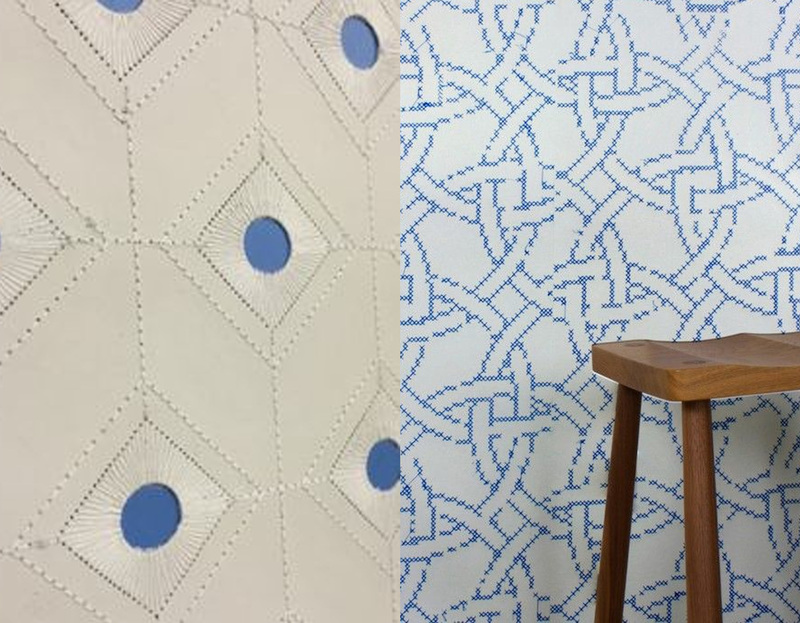 Machine embroidery, and small repeat for the design will make it possible to produce some modern embroidered wallpaper. Dutch designer Hella Jongerius is mixing industry with craft, tradition with contemporary art. She is exploring different materials and techniques, playing with colours and surfaces. Embroidery, once seen as something of your grandmother's world, things you could find in less fashion-minded houses, is making a major come-back. We can appreciate the handwork of a truly beautiful art form. The most popular designs we see in embroidery are flowers, or ethnic, and traditional patterns. Artists and designers are thinking "out of the box" to create very modern pieces: big scale, unusual combination of materials. Rives de la Beauté, has been working together with Kathrin Laurent / Lundi Studio to design the new cover for their Beauty, Perfume and Wellness Event in Paris, 3 - 10 sept. Where beauty, poetry and handcraft meet. The art of embroidery has been found worldwide. Traditional, ethnical embroideries were part of every household. Several early examples were found. In the Medieval Islamic world of the 17th century embroidery was called the "craft of the two hands". Suzani is a type of embroidered textile, made in Central Asia. Traditionally they were made by brides as part of their dowry and were presented to the groom on the wedding day. Usually Suzani have a cotton fabric base, embroidered with silk and cotton thread. Popular design motifs include sun and moon, flowers, fruits and occasional fish and birds. Embroidery is also a folk art, using materials that were accessible to non-professionals. Olli, founded in 2010 by Joanne Zorkendorfer, is representing traditional crafts in a modern format. The heart of Otomi embroidery is located in the town of Tenango, Mexico. The Otomi people were forced to find a new form of revenue in the 60's after a drought hit the farming community. This type of embroidery can be traced back to its Spanish and Aztec roots with its use of satin stitch and repeating side profile motives. High above the town of Tenango are a series of caves called Sirius, inside the caves are drawings of figures, birds, and animals. 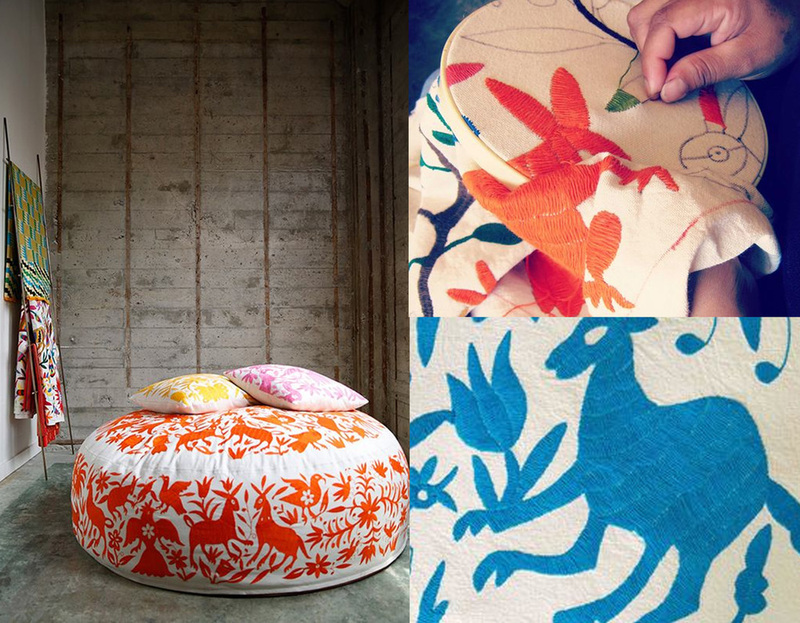 The legends tells us that those drawings have inspired the Otomi embroidery. It takes an embroiderer 3-4 months to complete a lounger. The embroideries are mostly done by women, all ages, in the house, on the street or on the market. When artists are working with a traditional technique as embroidery than we know that they are exploring the edge between art / tradition / kitch. The delicate portraits of Cayce Zavaglia are getting very powerful when you look at back side of the work. A series of actual helmets, from various wars and several countries, have been hand-embroidered with delicate flowers. Powerful work of Lithuanian artist Severija Inčirauskaitė Kriaunevičienė, titled "Kill(ed) for Peace". "Life is Beautiful" the first series where the artist started to work with thread and needle on metal. An allusion to communist-era kitch, when enamelled pots were decorated with flowers and fruits. Embroidery: a story which continues. It will stay alive from generation to generation. Tradition will cross borders by touching the heart of people traveling around the world. Let me know if you have other ideas how to incorporate embroidery in your home.